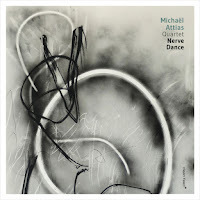 For more than ten years now, Michaël Attias has been a steady contributor to Clean Feed’s veritable treasure trove of contemporary jazz - beginning with 2005’s Credo, he has, time and time again, proven himself to be one of the finest bandleaders around. On his most recent effort, the evocatively-titled Nerve Dance, Attias is joined by Aruán Ortiz on piano, John Hébert on bass, and Nasheet Waits on drums. Needless to say, it’s a noteworthy list of names, one that is likely to make the ears of many of this blog’s readers perk up with interest. And lucky for them, Nerve Dance delivers in all the ways that matter - compositionally, melodically, texturally. While I’d stop short of calling it a “Grade-A, 100% masterpiece,” it certainly floats to the top of the pile of jazz recordings released this year - and I use the word “float” quite intentionally, as the eleven originals here (nine from Attias, two from Hébert) often have a sort of airy, dream-like otherworldliness about them, ensuring that the “dance” referenced in the album’s title is perpetually carried out just a few centimeters above the ground. That’s not to say it’s all lightness and cherubic charm, however; there’s a darkness here too, like the disquieting rustle of wings in a pitch-black forest. In other words: this thing has got atmosphere, and lots of it. Look no further than the opener. “Dark Net” storms right out of the gate with its elliptical swing; Nasheet Waits is the structural backbone of the piece, offering jarring rhythmical changes and busy, rolling frills that keep the composition in a perpetual state of motion. Ortiz makes reference to Monk and Hill with stretches that are often laconic, but sometimes trip over themselves in complex rounds. Hébert, as always, is a pleasure - he’s not the flashiest player around, but his workmanlike dedication to producing “the bass-line of best fit” is admirable. Finally, composer Attias brings a full-bodied warmth to the alto sax that belies the topsy-turvy, serpentine nature of the compositions - while he could easily get away with ear-piercing squeals and guttural honks (à la perennial avant-garde altoist Braxton), he instead settles on an approach that is deep, rich, and melodic, with occasional forays into the blistering altissimo register. That’s not to say that he’s straight-laced or boring, however. On “Le Pèse-Nerfs,” witness his wild, breathless runs and frantic shrieks. It speaks to Attias’s versatility that the opening of the very next track, “Rodger Lodge,” sounds like something you could hear being played in an upscale jazz lounge. While the first few pieces are jaunty, uptempo numbers, the album eventually takes a turn towards compositions that are more subdued. “Moonmouth,” for instance, rides on a simple and alluring melody from Ortiz, one that ascends the scale in a tentative, measured way. “La Part Maudite” is similarly understated, with Hébert bowing out gruff notes, Ortiz working in fits and starts, and Waits encircling them both with his limber patterns that always seem to be in a searching mode. The opening of “Dream in a Mirror” is something of a low-key showcase for Hébert - here, his solo does indeed sound like something plucked out of a dream. Once the others join in, the dream solidifies and we’re left with a piece that alludes to late-period Coltrane in the way it blends Waits’ billowing percussion, Ortiz’s intoxicating clusters, and Attias’ near-mystical presentation of the main motif. If “Dream in a Mirror” is the initial burst of ecstasy, then the following piece “Ombilique” is what happens when your spirit re-enters your battered, exhausted body: a slow return of consciousness, with all the lumbering movements and half-formed thoughts that that entails. By the time “Nasheet” rolls in, you can’t help but imagine that you’re nearing the end of a journey, even if it was just a journey to some other mental state. Considering it carries his name, you’d expect “Nasheet” to be where Waits finally lets loose and blows us all away with his manifold techniques. He does, somewhat, but it’s in the form of a slow burn - he’s too good to be showy, so he instead regales us with his loose-limbed rhythms, clattering patterns that, thanks to the exceptional way in which this album was recorded, move fluidly back-and-forth in the mix. As a unified statement, Nerve Dance works wonderfully. Not only are the compositions top-notch, but the players themselves have a telepathic understanding of when to “show their cards,” so to speak, and when to lay low. Not to mention, the sheer range on this thing is appreciable: there are tracks that swing, tracks that float, tracks that partake in rapturous dances, and even tracks that howl in pain. I recently came across a quote from Robert Penn Warren; when talking about poetry, he noted that it “demands participation, from the secret physical echo in muscle and nerve that identifies us with the medium, to the imaginative enactment that stirs the deepest recesses where life-will and values reside.” I couldn’t help but relate the quote to this album, and jazz in general. When the music is good, and when you are truly engaging with it, it feels like every nerve in your body is indeed activated, spiralling and spinning and whirling. This “nerve dance” is one of the reasons we love free jazz, and anyone who gives Nerve Dance a shot will get to experience it in full.